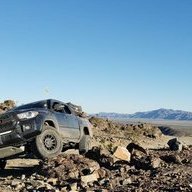 Join the Bay Area Meet-up in Death Valley this Presidents Day weekend, Saturday the 16th thru Monday the 18th, for some easy trail rides and camping. The itinerary is: Day 1: I will leave the Bay Area from Dublin, CA @ 0600. Arriving at Panamint Springs around 1300-1400. We can convoy down and meetup with anyone else in Panamint Springs. All camping will be dispersed (why pay to camp when there is so much desert). Once we have all gathered in Panamint, we will find some dirt and locate our campsite. Day 2: Trail day - Sperry Wash or Butte Valley, both are easy trails and will take between 5-7 hours each. We could potentially run them both, however, I'm open to further suggestions. We will need to keep in mind there will likely be stock vehicles with us so that will limit how much we can accomplish. Day 3: Rainbow Canyon a.k.a. Star Wars Canyon for photo opportunities or more trails. Convoy back to the Bay Area should leave no later than 1500 to ensure we arrive back before midnight. All scheduling is subject to change, be sure to watch the thread.